A few years ago, Lalitha’s teachers were concerned about her progress. No matter what exercise they assigned her, the outcome was the same: a single cell of braille with all six dots embossed. 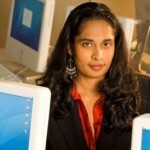 Then, Lalitha was chosen to test a computerized braille-writing tutor developed by our team of researchers at Carnegie Mellon University.3 As she wrote using the electronic slate and stylus, the technology provided immediate audio feedback to guide her writing and correct her mistakes. (b) The tool revealed what was holding Lalitha back: She understood everything about braille except the concept of writing each character in a different cell – a simple mistake that was nonetheless difficult for her teachers, most of whom were themselves blind, to diagnose. A student and teacher using Carnegie Mellon’s electronic braille tutor. Lalitha’s story is the exception to a general rule: Much of the developing world lacks access to technologies that many people in wealthier nations consider basic. For example, 77% of people in the developed world have access to the internet, compared to 31% of people in the developing world and 16% of people living in Africa.4 Technological advancements cater to the whims of consumers in the U.S., Europe, and other wealthy regions, at prices they can afford, while the rest of the global population is often left to repurpose existing technology or find ways to do without. One reason for these disparities lies in the assumptions businesses make about the purchasing power of less privileged communities. Simply put, people don’t believe these potential customers have enough money to justify the cost of developing technologies tailored to their needs. Mobile carriers, for example, do not always consider it worthwhile to spread cellular networks to rural areas where they assume few will use them. The tendency of innovation to cater first to the needs of the wealthy and powerful is slowly beginning to shift. In the 1990s, as the internet, mobile phones, and other communications technologies were becoming more advanced and widespread, the Information and Communication Technology for Development movement (known as ICTD or ICT4D for short) was born.8 The ICTD community consists of government agencies, non-profit organizations, businesses, and researchers dedicated to addressing the challenges faced by developing communities through technological innovation. Non-profits and governmental organizations like the United Nations are increasingly recognizing the role technology can play in international development. The U.N.’s Millennium Development Goals include expanding internet access, and the agency established a Global Alliance for ICT and Development in 2006. At the same time, social enterprises are using business approaches to achieve missions such as distributing technology to underserved communities. (e) Traditional profit-driven businesses are also beginning to recognize the “fortune at the base of the pyramid” – the often untapped potential of the poor to contribute to the global market.9 Industry giants Microsoft and IBM have established research centers to develop technology solutions for marginalized communities, and Facebook and Google are spearheading efforts to bring the internet to developing regions. Researchers and academics across the world have joined this movement to explore how technology can be better designed and distributed to meet the needs of underserved populations. At yearly conferences and research centers at major universities, this community brings together technologists interested in creating technology for underserved populations and social scientists with an understanding of international development. Within academia, the ICTD movement has given rise to a variety of innovations targeted to people in the developing world. Engineers at the University of Washington designed low-cost portable ultrasound devices for midwives in communities where medical services are limited. The Indian Institute of Technology created AAQUA (Almost All Questions Answered), an online agricultural information portal that crowd-sources answers to questions from Indian farmers. (f) My research team at Carnegie Mellon has designed and tested small robotic boats that can monitor flooding and deliver supplies in emergency situations at a low cost.10 These creative, low-cost solutions might be overlooked in research driven mainly by the needs and interests of those in the developed world. 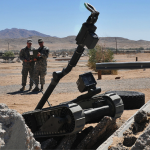 To support the creation of ICTD innovations like these, I established the TechBridgeWorld research group at Carnegie Mellon’s Robotics Institute. The focus of our research is creating educational tools for underserved populations and assistive technologies for people with disabilities. Understanding our users is critical to developing tools tailored to their needs. For projects like our braille tutor, we partner with schools to develop and distribute technologies that help their students learn. (g) Other TechBridgeWorld inventions include navigation aids for the visually impaired and software that allows braille printers to print tactile graphics. While technology is critical, it is not a magic bullet that can simply be dropped into a community. Successful ICTD research requires understanding social and cultural contexts as well as technological needs. It often entails crossing cultural, linguistic, and geographic boundaries. It is, by necessity, a multidisciplinary effort that requires the skills, efforts, and resources of many different sectors and organizations. At TechBridgeWorld, we have found that a key element of success is the formation of strong partnerships in target communities. These relationships help us understand the local context around the use of a particular technology, how to ensure access for different demographics, and how to sustain a promising intervention over time. For example, the braille-writing tutor used by Lalitha is based on the traditional curriculum followed by most of our partner schools. It incorporates mechanisms to customize vocal feedback in local accents and trusted voices. Underserved populations can be more than partners in projects initiated by researchers in the developed world; we now see a growing network of innovators coming from within these communities themselves. For example, organizations such as the African Robotics Network are striving to empower a new generation of technologists in Africa who can create innovation rooted in a deep understanding of the needs of their communities. Just as its leaders will not come solely from the developed world, the benefits of ICTD will not be limited to the developing world. When faced with innovation challenges that present a large number of constraints, researchers are likely to develop solutions that are more economical, robust, and accessible. An increasingly diverse set of innovations and innovators has the potential to enhance technology for the entire global population. Lalitha’s name has been changed to protect the privacy of the research subjects who participated in this project. New York: United Nations Development Programme. 2009 IEEE/RSJ International Conference on Intelligent Robots and Systems (IROS 2009) proceedings. Telecommunication Development Bureau (2013) “The World in 2013: ICT Facts and Figures,” Geneva, Switzerland: International Telecommunication Union, United Nations. Jim Jansen (2010) “Use of the internet in higher-income households,” Washington, DC: Internet & American Life Project, Pew Research Center. Aaron Smith (2014) “Older Adults and Technology Use,” Washington, DC: Internet & American Life Project, Pew Research Center. Susannah Fox (2011) “Americans living with disability and their technology profile,” Washington, DC: Internet & American Life Project, Pew Research Center. For an overview of the history and trajectory of ICTD research, see Richard Heeks (2008) “ICT4D 2.0: The Next Phase of Applying ICT for International Development,” Computer, 41(6): 26-33. C.K. Prahalad (2004) Fortune at the Bottom of the Pyramid: Eradicating Poverty through Profits, Wharton School Publishing. Paul Scerri, Balajee Kannan, Pras Velagapudi, Kate Macarthur, Peter Stone, Matthew E. Taylor, John Dolan, Alessandro Farinelli, Archie Chapman, Bernadine Dias, and George Kantor (2011) “Flood Disaster Mitigation: A Real-world Challenge Problem for Multi-Agent Unmanned Surface Vehicles,” Proceedings of the Autonomous Robots and Multirobot Systems Workshop. (b) The tutor also includes instructions for writing braille using the slate-and-stylus method, as well as learning exercises and educational games specifically designed for blind students. Students can use the tutor in many different languages by simply adding a character map and relevant sound files for each new language. (c) While braille is usually typed on a typewriter in the developed world, the traditional slate-and-stylus method is more like handwriting: The user manually embosses braille dots onto paper (the slate) with a pen-like object (the stylus). Despite being portable and affordable, this method has several disadvantages, including the need to learn mirror images of the “reading” versions of the dot patterns for “writing” on the other side of the paper and the physical exertion and manual dexterity needed to write. (d) The gap in access to information and communication technologies between groups such as the rich and the poor,5 the young and the old,6 people with and without disabilities,7 and the developed and developing world is known as the digital divide. This divide has begun to close as the price of information and communication technology drops. 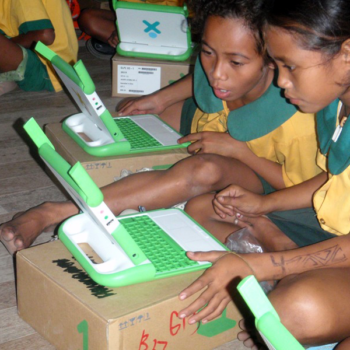 (e) The social enterprise Green Wifi, for example, creates new mechanisms for providing internet access to remote communities. 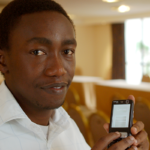 Similarly, Text to Change distributes mobile devices with education and healthcare apps in Africa and South America. The International Telecommunication Union announced last year that there were almost as many mobile-cellular subscriptions as people on the planet. For this reason, most internet access in the developing world is likely to come via mobile devices. (f) Farming is central to India’s economy, yet many farmers live in poor, secluded rural areas without access to information about farming techniques, prices, or weather forecasts. Systems like AAQUA and the Indian conglomerate ITC’s eChoupal provide access to this information. (g) Carnegie Mellon released the braille-writing tutor software under an open-source license so that, in keeping with our mission of overcoming barriers to technology, anyone can download it. M. Bernardine Dias is an Associate Research Professor at the Robotics Institute at Carnegie Mellon University, primarily affiliated with the Field Robotics Center. Her research focuses on culturally appropriate computing technology that is accessible and relevant to underserved communities.